Cinemazoo is fortunate to be located in beautiful Abbotsford, B.C., where there is an abundance of cultural backgrounds. Many of these cultures have elaborate wedding ceremonies, including traditional Indian weddings. If you are planning an Indian wedding and are looking to have a traditional entrance for the groom, look no further than Cinemazoo. We are the leading company in the Fraser Valley that can provide you with the traditional Indian wedding horse, or camel for your groom’s entrance procession. There are many symbolic traditions associated with an Indian wedding. The ceremony is spread out into 3 parts over 3 days. On the second day, the actual marriage ceremony takes place. In a traditional Indian wedding, the groom makes his entrance on a white horse, or camel, known as the baraat. The groom is accompanied by his family and friends, all singing and dancing. He then meets his bride’s family at the entrance to the venue. The baraat symbolizes the pleasure and happiness of the Groom’s family in accepting the bride as part of their family, as one of their own. The baraat wouldn’t be the same without the traditional horse, or camel. 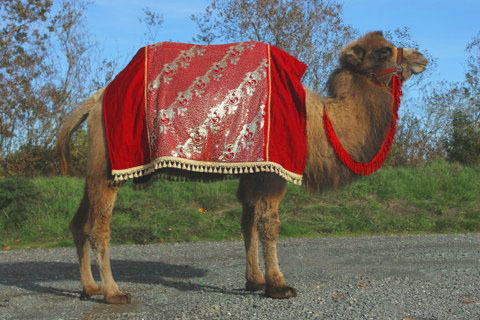 Cinemazoo can provide you with either a white horse, or a camel for your Indian wedding. We have the accurate Indian wedding outfits for both horse and camel, as well as the animal handler. Impress the guests at your Indian wedding with the addition of one of Cinemazoo’s horses, or camels for your groom’s entrance. Cinemazoo takes pride in making sure you and your guests have the best experience possible with our animals, and with our staff. We show up, rain or shine, set up, entertain your guests, and then do all the clean up, leaving absolutely nothing behind. With years of professionalism under our belt, why not choose Cinemazoo’s horse or camel as part of your Indian wedding? Contact us today for a quote for our horse, or camel for your Indian Wedding.